Technology is essential for impact in 21st century philanthropy. Efforts to improve our world are now amplified exponentially through giving tools such as Growfund, crowdfunding platforms, impact assessment software, grants or volunteer management tools, and a growing array of innovations. This is what makes bbcon one of my favorite events of the year. This conference put on by Blackbaud provides a unique environment for nonprofits and foundations to discuss in detail the role of technological innovation in the work they are engaged in. My presentation focused on the role of innovation in the fundraising space. Along with my co-presenter, Sharon Carney, Economic Strategy Director for Washington, D.C., I focused on the emergence of an ecosystem of funding sources that can help social impact organizations – social enterprises, foundations, nonprofits, universities, etc. – access new streams of funding through engagement with a broader ecosystem of funding sources, tools, and technologies. In many ways, the discussion with the audience revolved around an updated vision of the non-profit startup in 2017 versus, for example, 2005. In the traditional vision, a new nonprofit in 2005 opens its doors. The classic fundamental tenet of nonprofit fundraising is “no money, no mission.” As this new organization seeks to fund the work it wants to do to improve its community, it essentially has one vehicle through which it can raise funds: donations. These grant contributions can take a few forms but essentially depend entirely on donor appeals to donors of various income levels – individual donors, foundations, or federal or state grants. Now contrast this with 2017. 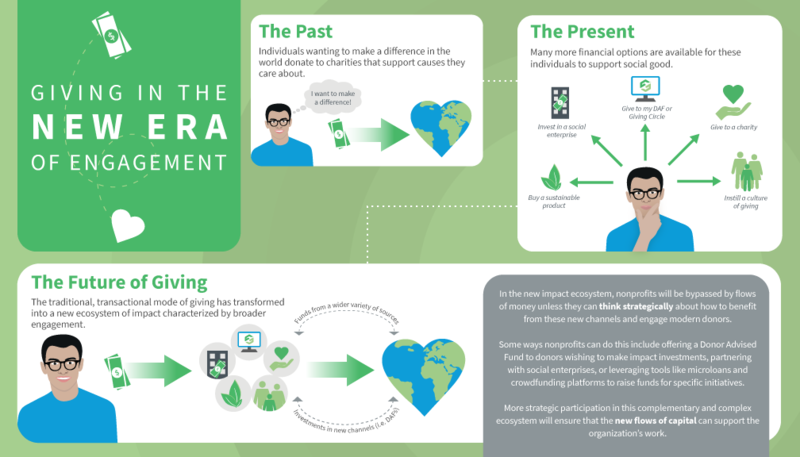 A nonprofit startup today can utilize new tools and technologies to access funding for its mission through an exponentially growing set of channels. These channels include crowdfunding platforms, the ability to start and manage a venture fund, the incubation of a social enterprise or revenue generating venture that adds value to the world, donor advised funds, and more. In many ways, this mirrors the longstanding ability of private sector startups to access multiple streams of funding as they seek to fund their work. These streams have traditionally included grants, numerous forms of debt capital, angel investments, venture capital rounds, and more. Increasingly, the ecosystem in which nonprofits operate within holds similar options. Together we discussed how this might change the fundamental character of the fundraising role within nonprofits, from “seeking donations” to “seeking to raise resources for efforts through engagement with a broader ecosystem of funding and support.” This is an exciting change in many ways that can allow nonprofits to find the type of “funding” or support that best fits its mission. We learned how the city of Washington, D.C. is innovating in building municipal support for this new ecosystem with the Impact Economy area of its economic strategy. This changed landscape was prominently on display throughout the conference, especially within the education/university sessions that were a real focus for the Growfund team at this year’s bbcon. Growfund has huge potential to transform university philanthropy. Our no-minimum donor advised fund can be provided to students from the moment they set foot on campus. In learning how to use Growfund as a personal foundation, these students can support their favorite causes with intention and engagement like never before. And then, as these students graduate, equipped with a personal foundation, they can maintain a connection with their alma mater that is tied to their giving for the rest of their lives. bbcon was full of great lessons in how universities are leveraging technology for their development efforts. Concepts such as “systemized lapsed donor reactivation,” activities such as tiering alumni prospects, or priorities like providing good experiences for alumni donors, are issues that Growfund can help to address and are all important for us to understand fully as we continue to shape a product that fits university campuses. With Growfund’s white labeled platform, we can provide data to universities on how their students are saving for their giving and giving to charities more broadly. This data can be immensely helpful in maintaining or re-establishing relationships with students or alumni who can see their interests and passions highlighted and reflected through their university’s programs. The possibilities are endless. I’m looking forward to continuing these conversations this week at the Independent Sector conference in Detroit.